Home made bread is far tastier than the shop-bought, heavily processed varieties of bread that line the supermarket shelves. Supermarket breads are filled with additives that make the bread rise quickly, to a very light texture without proving. However, these also render the bread sticky and doughy. Many people today complain of gluten intolerence, and avoid wheat and bread products altogether. But a big percentage of those people could probably eat Spelt bread. I'm talking here about gluten intolerence, rather than the serious allergy to gluten, coealiac disease. People with coeliac should always avoid wheat and any other gluten containing grain. Spelt is an ancient grain, related to modern wheat, and was a staple food in Europe from the Bronze Age to the Middle Ages, although there is evidence of Spelt growing much before those times. When growing it looks much more grass-like than wheat, and is extremely difficult to thresh, as the husk is quite tough. One old method was to put the Spelt on boards on the floor and allow horses and carts to drive over it. Thankfully, there are now several producers who do this difficult bit for us. Gluten is a mixture of two proteins, gliadin and glutenin, which reside in the grains of wheat, rye and barley. It is gluten that gives bread dough its elastic texture and allows it to rise, but it is these foreign proteins that can irritate the gut of sensitive people, and in Coeliacs can cause full-blown immune reactions. However, many people find the gluten in Spelt grain far less irritant than that of wheat grain. 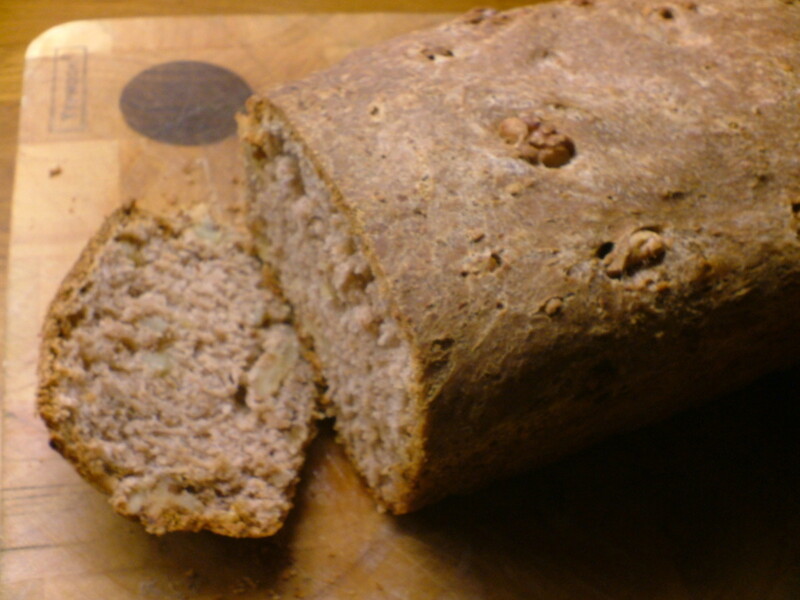 Spelt bread is wholemeal and has a close texture, relatively pale in colour, a little like rye bread. It's flavour is sweet and nutty. All home made breads are more dense than the white fluffy sliced stuff from the supermarket that sticks to your teeth, and wholemeal breads are even more so. Spelt bread is easy to make, the initial mixing and kneading taking only around ten minutes, but the rising process can't be rushed. it's worth taking a little time over this in order to get a better product at the end. 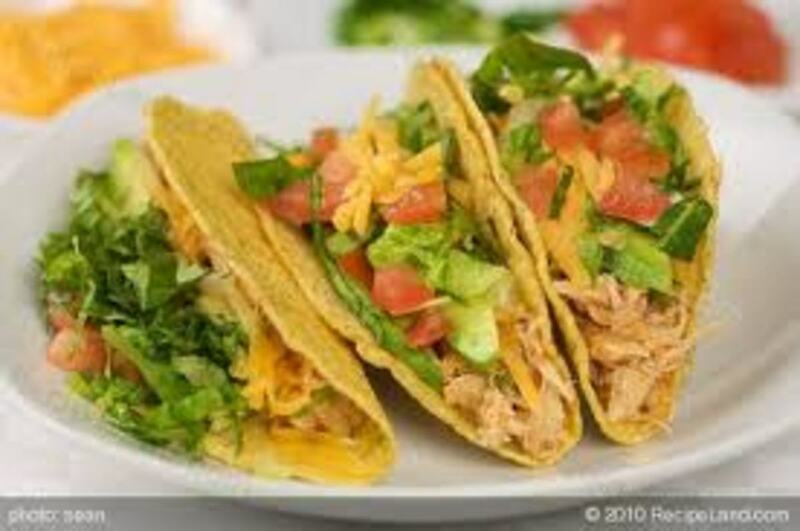 Here are a couple of my favourite recipes. I make mine by hand, but you can use a bread making machine, so I've included a note on that too. There is one massive problem with the walnut and honey bread - people keep eating the dratted stuff, so you have to make a loaf every other day! (It's really good with a little butter and a couple of slices of mature cheddar). I particularly like Dove's Farm Spelt flour, but there are other manufacturers out there just experiment. Weigh out the flour and place in a warm bowl. 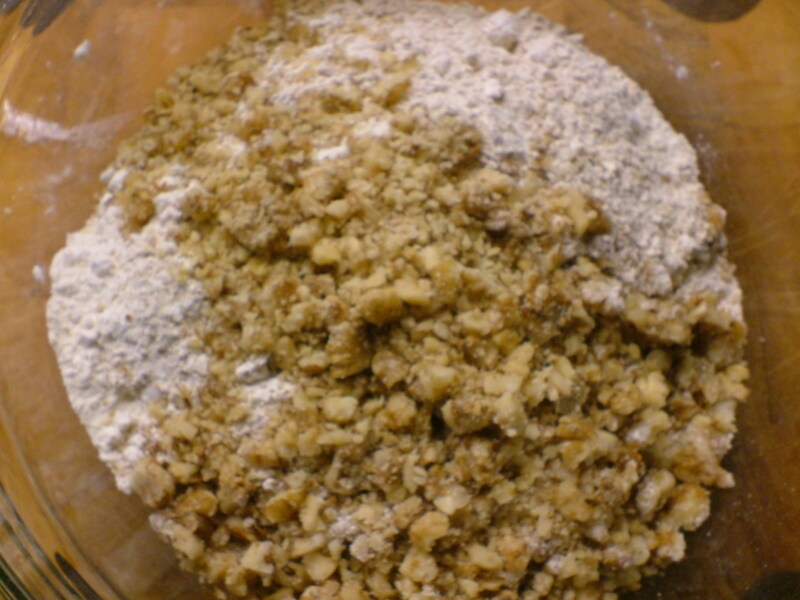 Add the salt, yeast and sugar and mix the dry ingredients together. Sometimes if I want a lighter loaf I use 6 oz Spelt and 4 oz white bread flour. 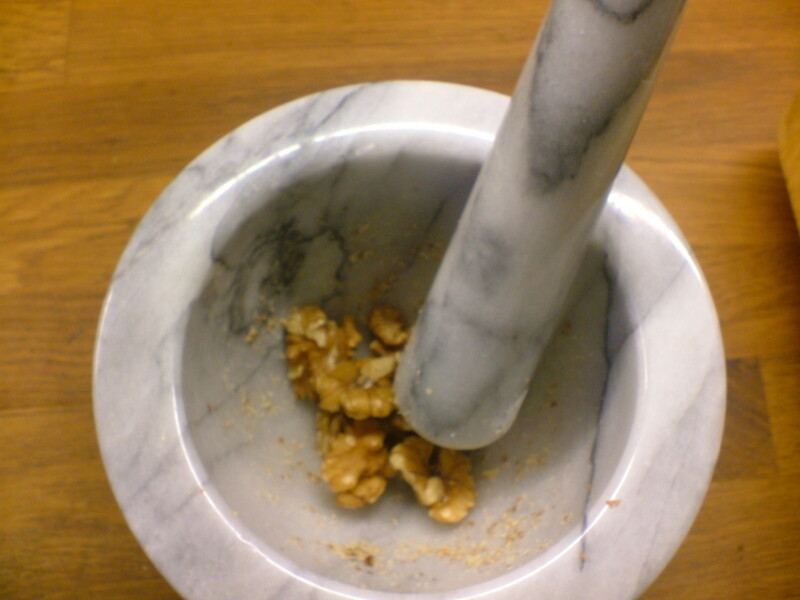 Crush the walnuts in a pestle and mortar or blitz roughly in a grinder. Mix these in with the flour etc. Measure out the warm water, which should be around hand-hot. Add the oils to the water and stir in the tsp of honey until dissolved. Add these ingredients to the dry ones and mix well until it all comes together. Lightly flour a worksurface and tip the mixture out. It's best to have it a little on the sticky side at this stage as it will firm up, and you can always sprinkle more flour over it if it's too sticky. Knead the dough until it becomes elastic, which will take around ten minutes. 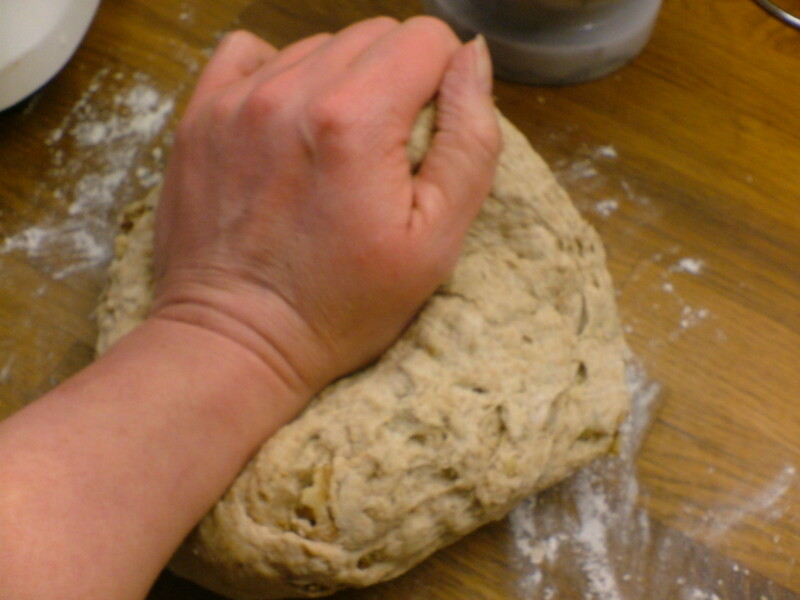 When kneading, use the heel of your hand and push the ball of dough away from you, give it a half turn and repeat the process, then keep going. This is the easiest way of kneading that I know about. Oil a large clean bowl, place the well kneaded dough inside and roll in the oil so that it's all coated. Cover with a clean cloth, then leave somewhere warm to double in size. This usually takes about an hour, but depends how warm your rooms are. When the dough has doubled in size, tip it on to the work surface again and re-knead it until all of the air has gone. Oil a loaf tin, shape the dough and place in the tin. Leave somewhere warm until very well risen. This can take quite a while, but it's worth the wait at this stage. This is called 'proving' and ensures a light, well textured loaf. To cook, place the risen dough in a pre-heated oven 220c (200c fan oven) or 425f, gas 7, Aga/Rayburn - chuck a couple of extra logs on! Bake for 35 to 40 minutes. To test if the bread is done, turn it out onto your oven gloved hand and knock on the base - it should sound hollow, anyway your nose will tell you it's cooked. Cool on a wire rack and try not to eat it all in one sitting. How Not to Make Bread. I'm sorry, this is so bad it's good. 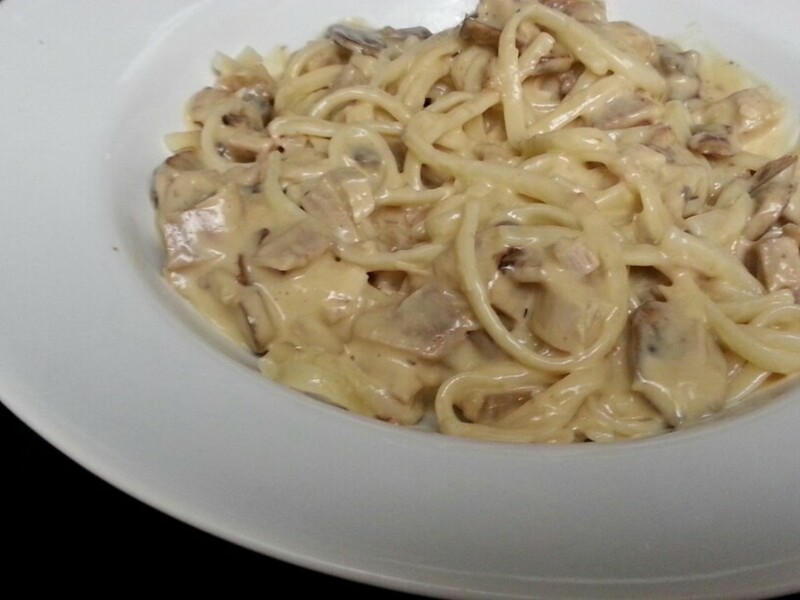 This recipe is a good basic one that you can play around with. you could add olives, sun dried tomatoes, poppy seeds, sunflower seeds, or whatever you fancy. Probably the best ways to make Spelt bread are to either use all Spelt flour and select the Spelt programme if your machine has one, or select the dough mixing programme, but bake the loaf in a conventional oven. alternatively use half Spelt and half strong white (bread making) flour. If that happens again leah, just miss out the proving process. 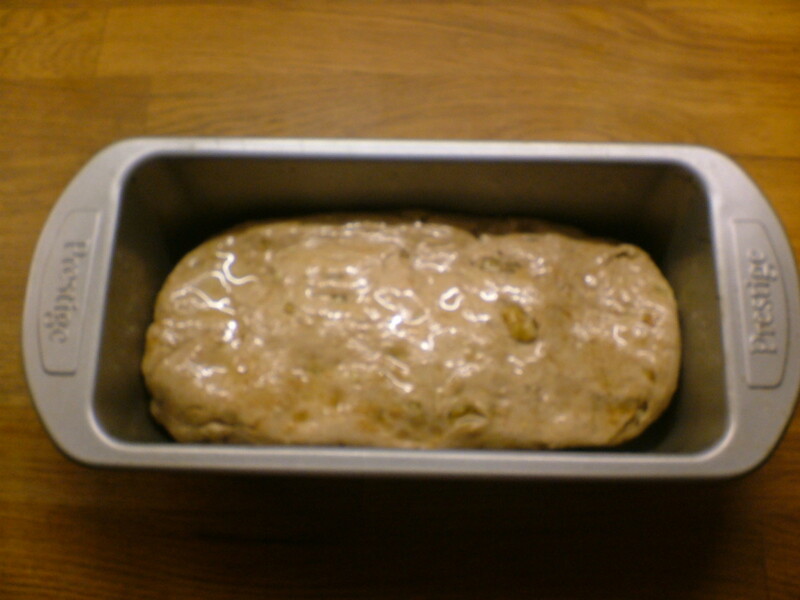 Put the dough straight into the loaf tin and let it rise, then bake, rather than proving. Should work well. Depends on your flour. I tried this reciepe today, well without the walnut portions to it. It looked beautiful up until right before I put it in the oven when it was starting to fall. 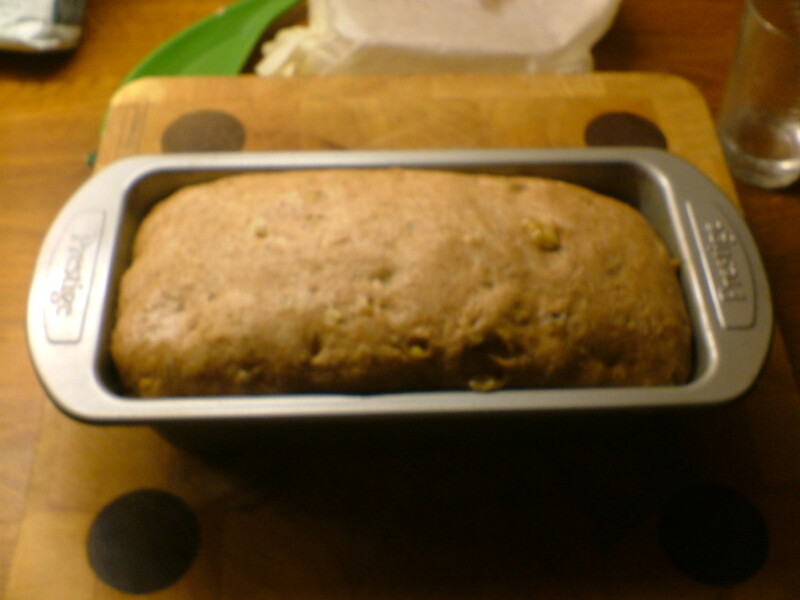 It did not keep it's shape for me in the oven and continued to compress, but it tastes great, has a good texture and does not take like a bread that has fallen. I'll try another loaf later this week and watch my last rise closer and perhaps use the recipe below for just the plain bread. It turned out better than I thought after talking with the lady at the health food store. She had me pretty intimidated that it was going to me more of a cooking challenge than I was up for. But not so, wasn't perfect but a good loaf. Thank you for ;posting these recipes. Sugar would be fine if you can't source honey. Yep, I never heard of Spelt and so never tasted, but it seems it is really good for health. But just ask you for more info, can we use sugar instead of honey (in case not available). Thanks angoliver. Judging by the traffic this hub gets, there are a lot of people with wheat problems who are benefitting from spelt. Great hub! I never heard of this bread before, but it sounds amazing!! Thanks itakins. We enjoy eating it as much as making it. U Neek. Thanks. I love spelt bread. Interesting that you grind your own wheat - I'll check out whether you have a hub on this. You wouldn't want to mill your own spelt, it's one of the toughtest grains known. Farmers used to throw it in a pile between boards and drive their carts over it just to crack the grain. Mind you, grinding spelt would build muscles and burn calories. Thank you lamme, we enjoy it. This sounds wonderful. Thanks for the recipes and great instructions! Hi Aidansmama. Must admit I've never got to grips with 'cups,' so it's something I'll have to google for you. I find with spelt, that the dough has to be quite soft and springy, otherwise you can, as you say, end up with a thick crust. I've also tried covering my dough with foil for part of the cooking time (leaving room for rising, but prefer the method I've written about here. Can you give me the flour and nut measurements by volume, please i.e. cups, tablespoons, etc. Most people here don't have kitchen scales (myself included). I really want to get better bread from Spelt flour, but so far, I end up with something with a thick dry hard crust on top (about 1/4 inch thick), and sometimes very crumbly inside. BTW: Where I live now the climate is very dry, and the altitude is 668 M above sea level. When I've baked wheat bread, I've had to add more water than when I lived on the coast with high humidity and just slightly above sea level. I do have a bread maker, but it doesn't have a Spelt setting. 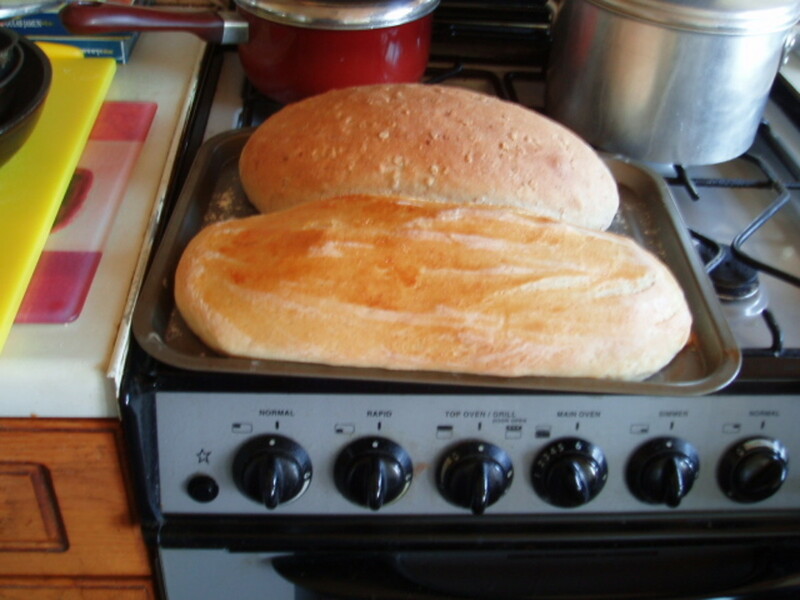 Ah bread making, what an art, I'm a chef years and bread making is my weakness ha, but I usually get there in the end. Nice recipe with the walnut and honey. Thanks, the Old Hack - I never thought of using a rolling pin - good idea. Hypnodude - wasn't my intention to make you hungry, but glad you liked the hub. I just made some mushroom pate today which goes really well with Spelt bread. Interesting hub Georgina, I don't know if it was your intention but after finished reading your hub I was hungry for a piece of spelt bread. Very clean and informative hub. Good hub. Nice to see how somebody else does it. Personally we use a rolling pin to knead the dough, it’s less strain on our dodgy old joints. Thanks. I find it definitely kinder, and I'm keen to spread the word. Great hub Georgina. I use spelt flour quite a bit in baking, particularly in pastry and I really like it. I think it's a lot kinder to our digestive system than regular flour, or at least I find it so. Thanks, It's very popular with people into health foods, and those with IBS type symptoms that they put down to eating wheat product. 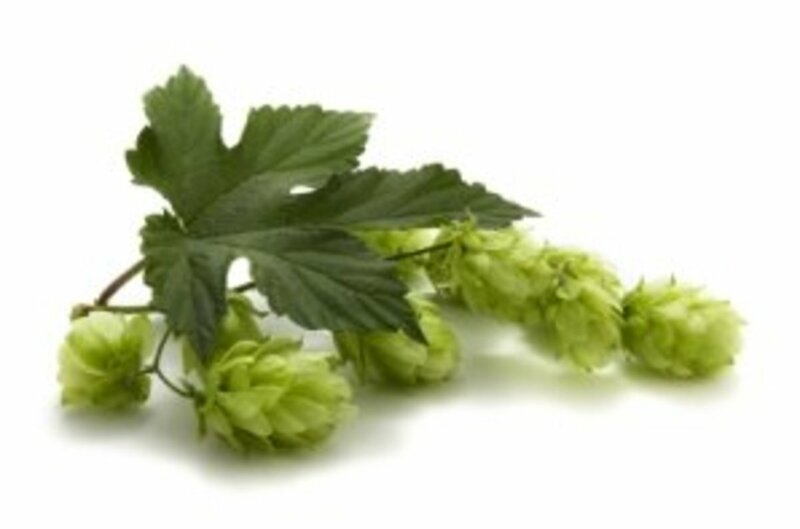 It's basically a grain that hasn't been tampered with or modified over the centuries, so is therefore more 'natural'. It also tastes good and it works - it is less irritating for the gut. Interesting hub. I haven't heard of this bread before.